I finally got video!! Let's see how to attach it. Nice job Jim!!! Did I read that you flew her on 50' lines? She's fast man!! I'm amazed by how well she handles on just one engine. I need to get a good head-on shot when she drops the outboard engine. I noticed what may be a fuel draw issue late on a few flights when starboard died way early in the flight. My suspicion is that significant yaw to starboard may be pulling fuel to the front of the running tank. The remaining engine hunts a bit, sags, and then picks up in a burst before flame out...then landing. But this has happened only when she flies on one engine for the majority of the flight, and nevr just after the outboard engine dies. I do know she still has the ability to climb without hesitation on one engine...and still really pulls on the handle. On two engines it pulls with authority, climbs aggressively, and particularly pulls out at the bottom a lot better than a flat plate wing should! There is one dive in the video that made me appreciate how good it looks pulling up...it sure "feels" like the video shows. I'm dying to try three bladed props on it...just curious what to expect! A plane that is yawed out will certainly contribute to this problem. The solution is to correct it by finding out what is the root cause. 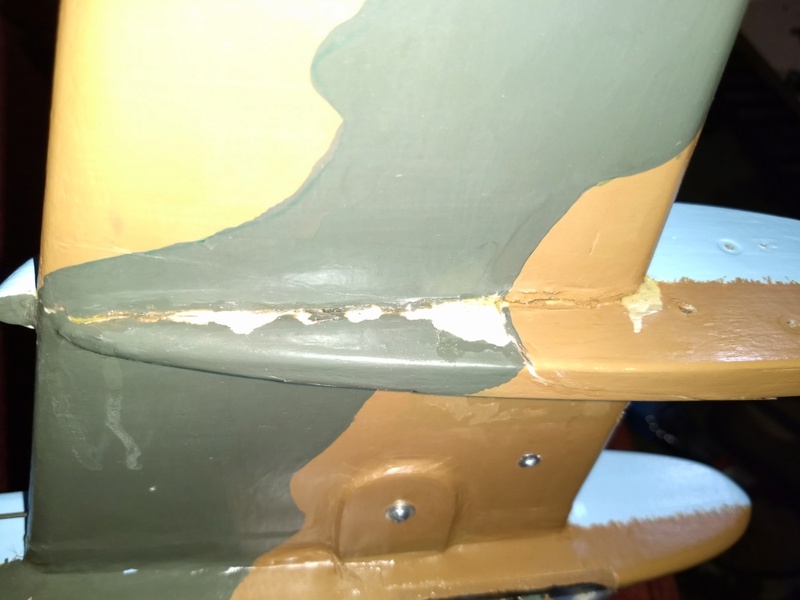 This can be engine offset, too much line rake to the rear of the wing chord or rudder offset. Correcting one at a time is highly recommended.Even a plane that is not flying level can cause problems like this. My reference to level is not in relation to the plane from a pilots sight engine to rudder but the wing from tip to tip. Launching a click or two richer may also help as the head pressure lessens the engine is leaning more and it's starving for fuel. Insuring that the pickup is soldered internally and in the correct position is important as this is another factor. The other which is one that won't show it's ugliness even in a air test is using brass tubing. Brass tubing is not seamless and it can form a hair line split within it. Perfect brand tanks are notorious for this and piping can split due to age even if it was never used. When the tank gets low, your sucking air which offers the symptoms that are associated with the engine struggling. Did the engine use all the fuel? Is there fuel left in the tanks after the flight? This is a common symptom of a too much yaw. Kicking the rear of the tank outboard if there's enough room can assist this. It sounds as if the fuel is getting pinned slightly inboard of the pickup tube. I do recall that you were using muffler pressure. Are you still using muffler pressure? How does the tank look internally around the pickup. If there's even a slight hint of oxidation of the tin plate due to soldering, I would thoroughly clean that out. While it's hard to tell from the video as they're always difficult to diagnose, having a tank that's uniflow offers you 4 options of running the engines. in the event uniflow doesn't help, it can be capped off and used just as a fill pipe. It can cure certain problems. You could run the tank standard vent, uniflow to the atmosphere, muffler pressure to the vent, or muffler pressure to the uniflow. Each choice will be slightly different. If possible though, uniflow to the atmosphere would be optimal. 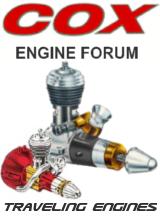 The problem with muffler pressure is that it's dictated by engine speed and therefore you will have to set your needle slightly richer initially to accommodate loss of head pressure in the tank. The options mentioned above though are all relevant to tank positioning. Some engines are very sensitive to side to side such as a TD. Therefore if your pickup is too far outboard none of the solutions above are going to correct this. The solution to this is to shim the engine off the doublers which is not going to offer much or move the tanks inboard closer to the fuse's. Another option is to use a longer tank front to back and narrower tank side to side. Thanks for your valuable input...all points worth considering! I do want to stress that this thing flat out gets it when both engines fire up quickly and shut off outboard first, followed shortly by inboard. Any time a significant portion of the flight is single engine, well, it's just part of why one wants both engines running...and adds to the excitement of a single engine flight! After all, where is the fun of dropping an engine if all the plane does is slow down? Fuel tanks Version 1 sat above spraybar level on top of the wings. I could NOT achieve dual engine runs due to flooding from the tanks mounted so high. This was a blessing in disguise. They were commercial 1 oz tanks! This was abandoned after four attempts, with none ever getting off the ground. The Version 2 tanks are custom built, very shallow, in order to keep their vertical centers close to the spray bar level as possible (thus minimizing head pressure changes). They were built using copper tubing from an automotive oil pressure gauge line kit. They are wider than I wanted in order to keep the floor of the tanks closer to spraybar level. I needed to go across the wing, but still behind the engines because the engines are mounted so close to the leading edge in order to slide the CG back away from the leading edge. 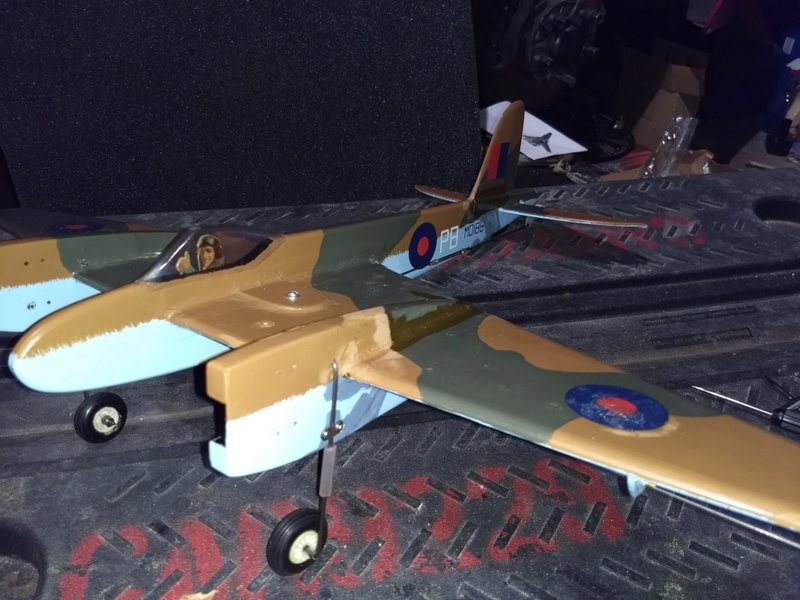 I did the engine location change because Mike Londke's Mossie is flying two .061's and he reported to me that his was nose heavy. Mine doesn't dive down after engine shut off...but it does glide fairly level as it descends (like a featherweight brick!). Running tanks close to the engine nacelles going back was considered, but the inboard one would foul the lead-outs. I may make new tanks slightly deeper, and longer front to rear, and narrower, definitely with more rear/outside kickout. 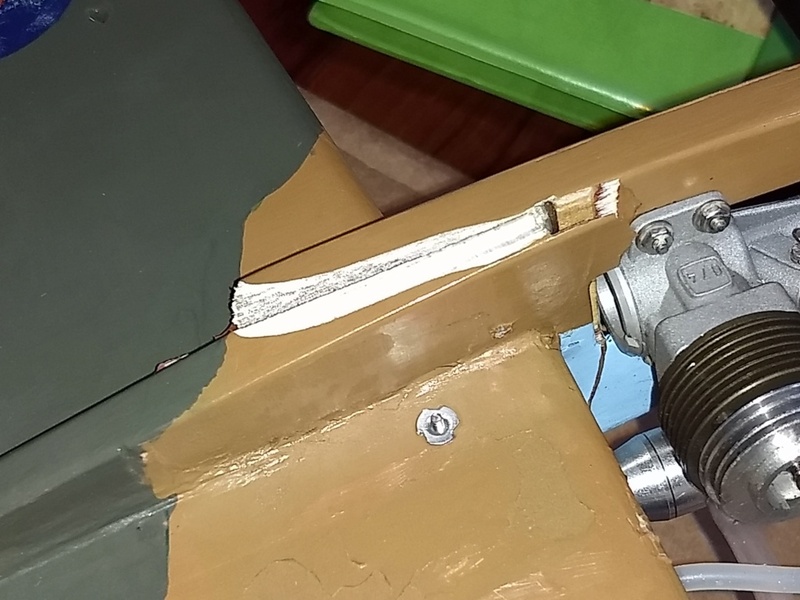 If I do redo the tanks, then the controls will go above the wing...I reinforced the bellcrank bolt holes on both top/bottom of the wing, so this part is easy. The leadout guide plate will move topside, and made adjustable. The tanks may even wind up inboard on the nacelles in order to beat drawing fuel inward to the engines. They'll also have vent/fill/supply lines. It is aggravating to remove the muffler pressure line to fill the tanks. The vents will be topside...right now they are in the outboard side wall of the tanks. Move the bellcrank above the wing in order to be able to run tanks along the nacelles under the wings...and use smaller engines so you can move them forward off the leading edge of the wings...and build the strengthening spar into the wing, instead of on the leading edge (that's where the kit company says to build it). That way you may be able to inset the tanks into a balsa leading edge without compromising wing strength. Optionally run the engines vertically so you can make/mount deeper tanks. Either cylinders down, tanks under wing or cylinders up, tanks above the wing. Keep the controls on the opposite surface of the wing from the tanks. All in all, I call this one an exciting success. What I learned will be applied to a smaller..020 Tee Dee or Pee Wee version with built up wings. Watch for that build this fall...the wood has been cut and shaping started. 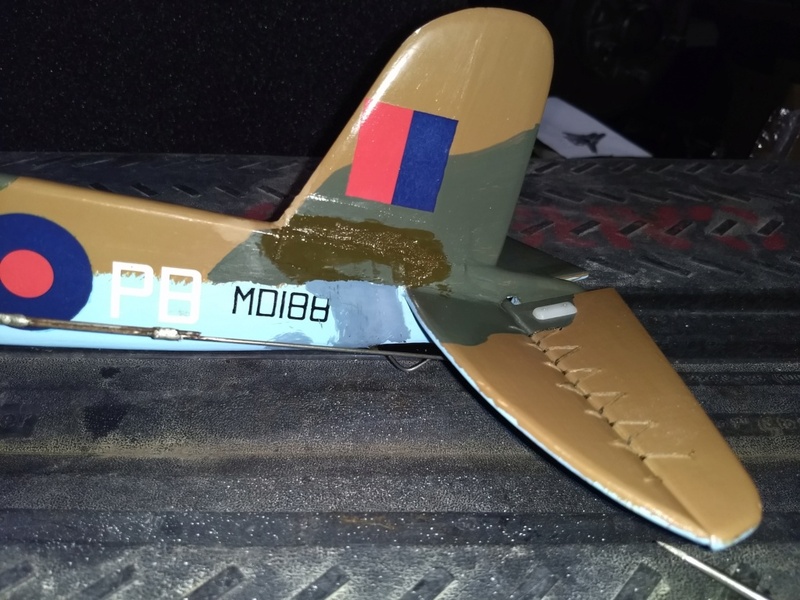 A scuff on the control side wingtip, wing separated at the engine pod, and a broken off tail with no scuff at the tip but little other damage seems to indicate some sort of low speed landing attempt. Perhaps lost line tension or inside engine failure? Anything else on concrete would be disastrous. Sorry to see this Jim.. but an easy/quick fix. 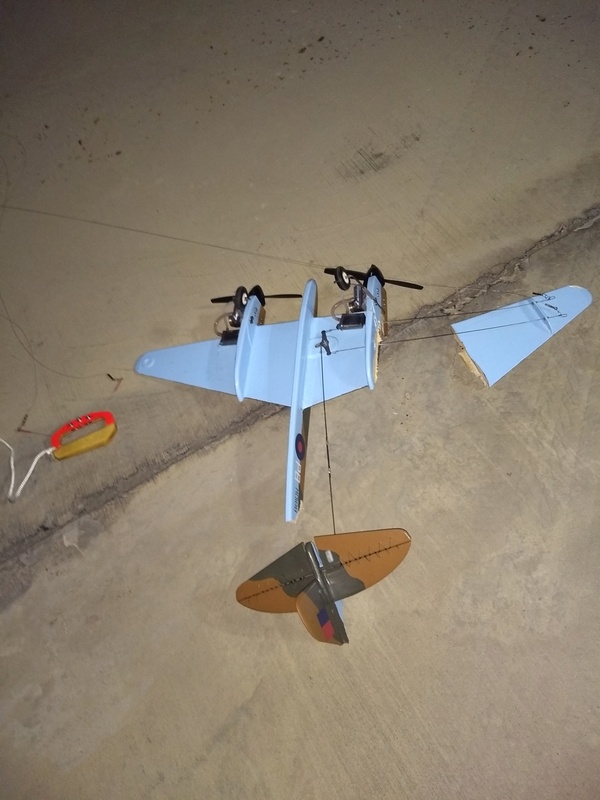 Yup, that's definitely not a bad crash and goes to show balsa flies better. If it had been one of those gleaming in chrome hard plastic Wen Mac P-38's that were available when I was growing up, it would have been history. Back then it was liberal use of Ambroid Cement and 24 hours, and it would be ready to fly again. Today I'd probably use water based Carpenters Aliphatic Resin Glue and same 24 hours, then seal and retouch up the paint, fly again. You'll have it back in order and flying again, Jim. O man what happen there Jim !! 100' circle inside of 120' square with lamp posts on each corner. It was after sunset. The ground runs were, well, not without issues. By 9:00 the lamps were fully warmed up/lit. I had a certain respect for ground combat troops as the plane was visible four times per lap...and four times per lap not visible. Finally, after two tanks of run ups per engine, I got both engines running at the same time. So I ran, and picked up both the handle and the stooge line. One of the engines was starting to falter. I brought her closer to the ground. As the failing engine sagged and surged, the ground came up and fell away from the plane. I think the inboard engine failed as the plane staggered into the wind. Just as the plane came down to flare, the wind caught up under the plane and rolled her in on me. I couldn't backpedal fast enough...Splat! I really thought to let the plane go. 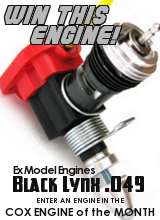 This frees up two good sized engines for more aggressive fliers. I'll get some other pics up. That inboard engine nacelle broke loose too. 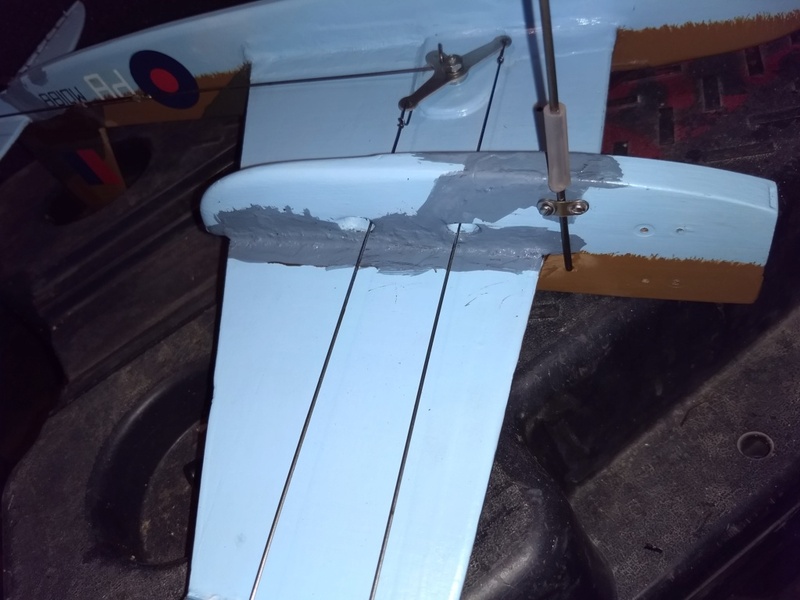 I think any repair can't make that inboard wing portion stiff enough with the line guide way out in the end. But after all the suggestions, I will look closer. 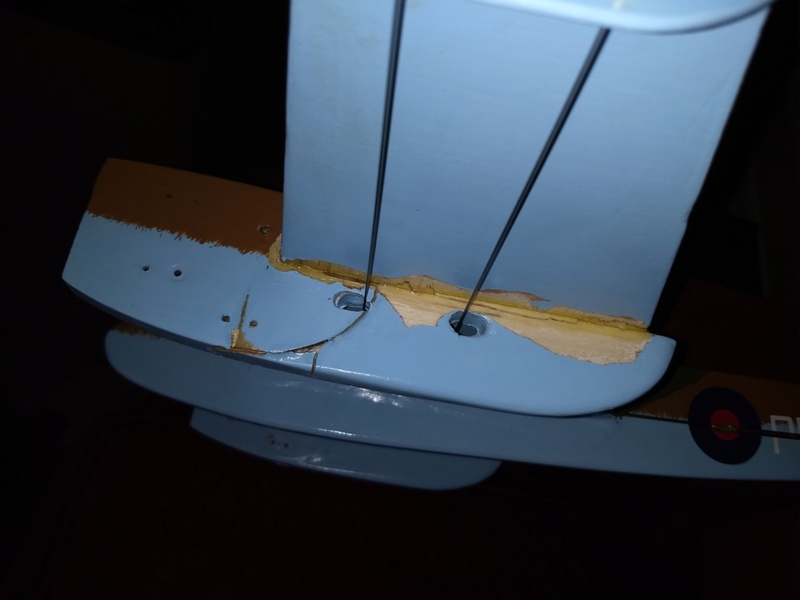 Jim, if it were me, I'd stiffen that weak wing area joint in the engine nacelle area with say a 3/4" wide strip of 1/32" plywood planking on the top and bottom, or cemented cloth hinge material. Trim engine nacelle wing area to fit. 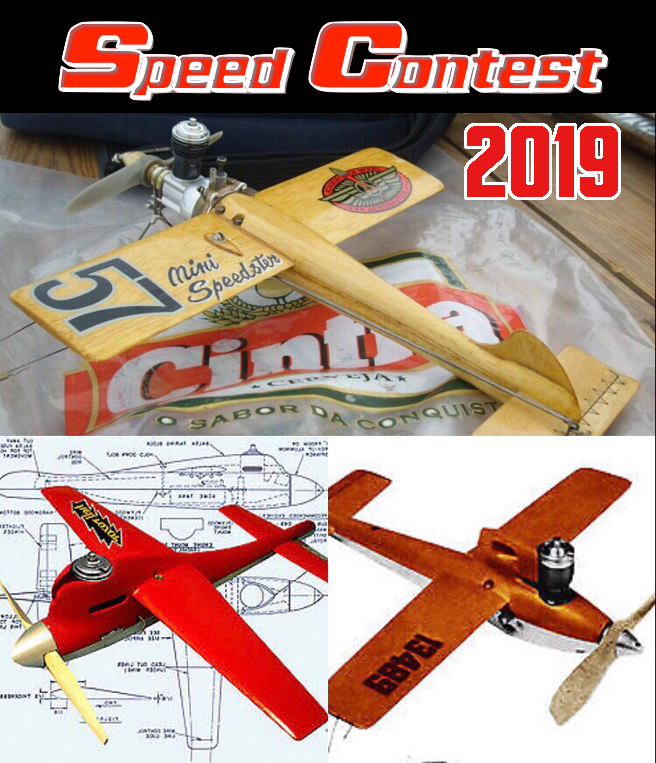 You could also install 1 or 2 short spars about 3" long (1-1/2" on each side of the fuselage) same thickness as the wing of hardwood or plywood evenly spaced midway along the chord of the wing. 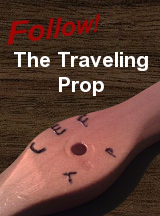 That would prevent that area from separating and strengthen the joint. Just a few ideas, there are others, but there are ways to fix that weakness you are experiencing with the kit's weakness. Night vision goggles and a matched pair of easy starting Enya .09's solves your problems. I bet Black Widows would fly it. reinforcements included drilling holes through the nacelles and wings to pin them together with bamboo dowels. The Captain says "No worries, Mate!" I had considered blaming poor engineering. 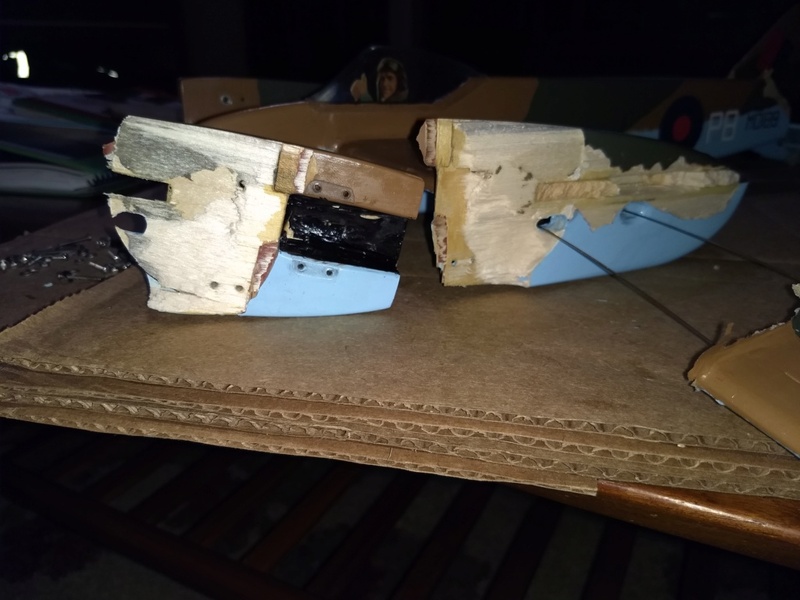 But the reality is that something had to break...I'd rather replace the plane (or fix balsa) than the engines. So, I'm ok considering how high the plane was just before it drilled a hole in the concrete! My first thought was "toss it." But then, y'all have me considering repairing the plane. The justification is that both engines need a platform to practice steady, easy, two engine runs. So now, here are the pieces. Ok...I removed a bit of the fuzz that may have gotten soft during the wetting of parts. I figured I didn't need anything getting in the way of such a big puzzle piece. Even then, once the wing was mostly slid in place, it stuck out of it's socket just a bit. I don't really think this will hold for very long, but it should last long enough to continue playing with twins. 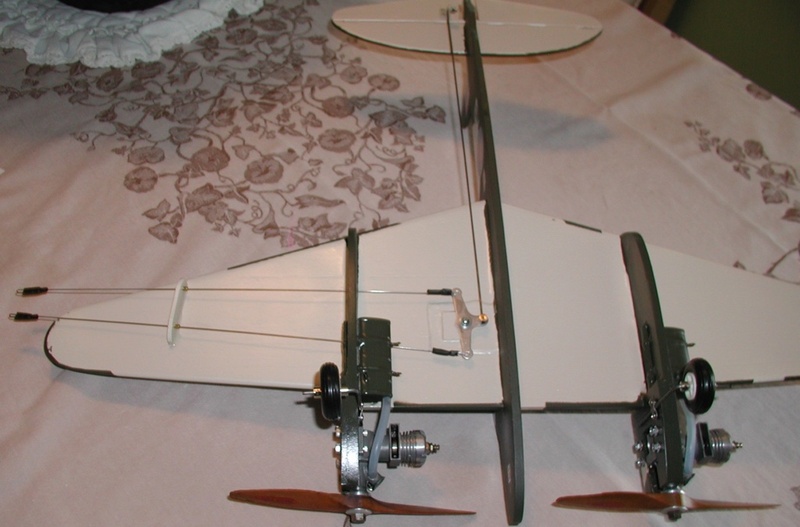 Once my next twin is built, I'll shelf or trash the airframe. Once the airframe was stripped and reassembled, I went in with more post crash analysis. I found the outboard tank rattled a bit. 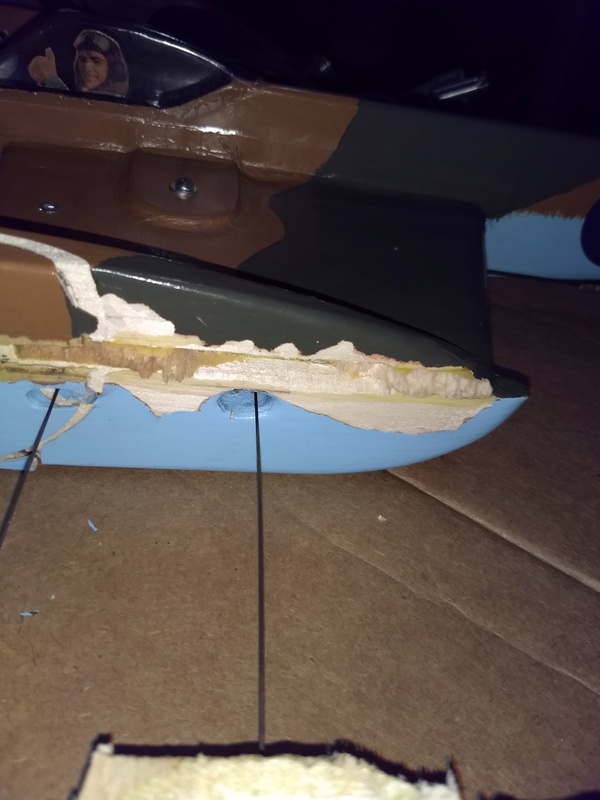 Maybe a slug of solder knocked loose, but I'm inclined to believe it has been blocking the fuel pickup tube off and on since the plane was finished...this is the leaky tank I found when I first attempted to fly her. I may remake the tanks. If so, they will be uniflow. I hated pulling the pressure line to fill the two tanks. More to follow...but she'll never look the same again! Go for it Jim, she don't have to be purtty to fly. Once it's out on the end of the lines you won't notice or even have the time to care. Back in the day, I rebuilt a few crashed planes myself, along with most everyone else here. If your married to those engines, great. They should be well broken in by now and become more reliable. PS: You put me to shame flying it. But, I have more free time now and hope to fly mine (or get my son to do it) sometime in the near future. Everything is better the second time around. Good to see that you've made some repairs Jim! I hope that the uni-flow tanks work out. Thanks for being the Cheerleading Squad, guys. Your positive encouragement kept this one from being junked. Only the hardware and Captain Blackhawk would have been recovered. I hope to 'glass both sides of the inboard nacelle (both sides of the nacelle) to wing seams in order to strengthen the joints. Maybe I'll find time this weekend. Tanks need to be drawn up, cut in cardboard, and mounted to check for any controls conflicts. I plan on kicking the outboard rear corners out about 1/4" to maintain fuel pickup after a single engine outage. Once patterns look good, tin will follow form. The new tanks won't have the outboard tapered to the rear wedge like the first ones. As pretty as they were, they were also most difficult to build on such a small scale. It's not like I'll be doing wingovers in the later parts of a flight anyway. Again, thanks for the cheers. Video/Pics will be posted. Bob, get yours slinging!! 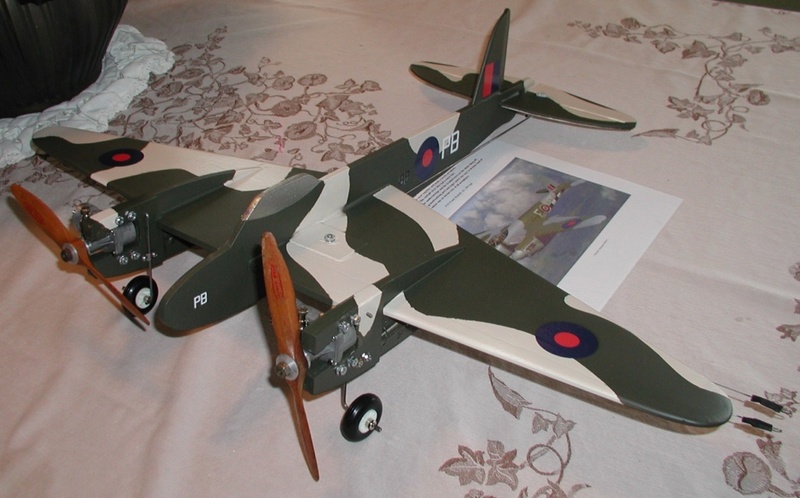 I'm dying to hear of a third BHM Mossie in the air! When you say "glass" you must mean fiberglass cloth reinforced with resin. I have a lot of that left over from the MG, sounds like a good idea. Adds weight though. Maybe an inch or so folded at the seam on four sides. Why not Perfect 1 - 1-1/2 oz wedges? There are many of them on the net and they intergrate well. I happened to have a couple on hand so I used them after cleaning and pressure testing them both. Yeah, I kept the field mowed next to my house just to be able to fly some planes but gave up as I couldn't keep up with it. It's a waist high hay field now. I will fly it though, before snow fly's. A promise. If/when crashed it will give me a chance to duplicate your better crafted cockpit design on the rebuild. in to assess, or repair. Captain Black Hawk pleaded to have the aircraft repaired. The only available paints were mixed together to get at least on same segment of the color wheel. Captain Black Hawk will find that enemy pilot, and seek retribution! Next set of tanks will be a bit deeper, but basically the same top view. However, this time there won't be a 3d wedge in the outboard side. Engines may get mounted tomorrow. Those pics will be next. The tanks may take a bit of time to cut out, and then 45 mins to solder together. I hope to fly her this weekend.